If you lived in Georgia in the early 2000’s and traveled to rural areas around the state in the summertime, you’d find something that wasn’t in the supermarkets, or even in the food warehouse up the street that carried produce and delicacies from all over the world: local peaches. I did, and in those days I often traveled away from our home in Atlanta for my job. Summer was the perfect time to pull up to one of the roadside market stands that materialized spontaneously along rural freeways in the southern part of the state. 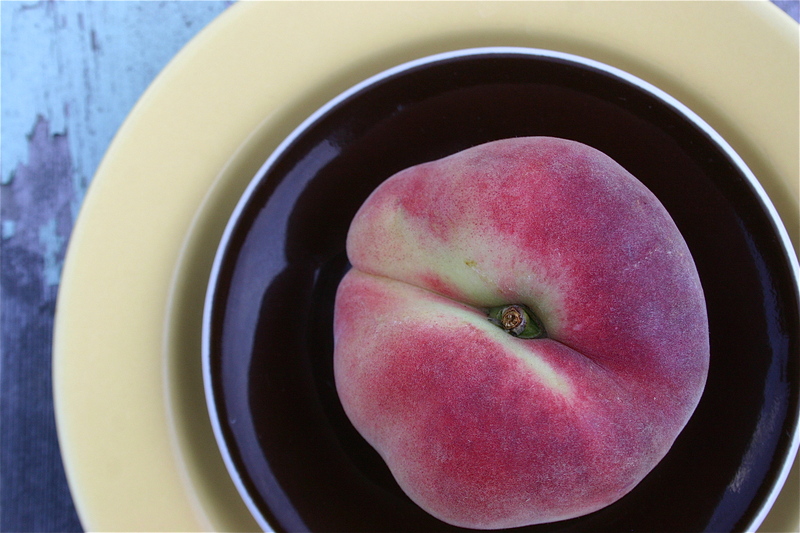 The peaches would be stacked in airy boxes on tables or sold out of the back of a pickup. More than once I stopped to buy a box of the semi-hard fruits, picked days before the skin would give beneath your thumb like the edges of the cushions on the good dining room chairs. Those were very good peaches. Now I’m in Washington State and it’s peach time. Call me a liar, but the peaches here, despite the fact that I’ve read our climate isn’t sunny enough, taste even better to me. Last week I saw some flat, fuzzy fruits on the top shelf of the produce section at the food co-op with flesh that faded from dark orange to saffron yellow. Donut peaches. 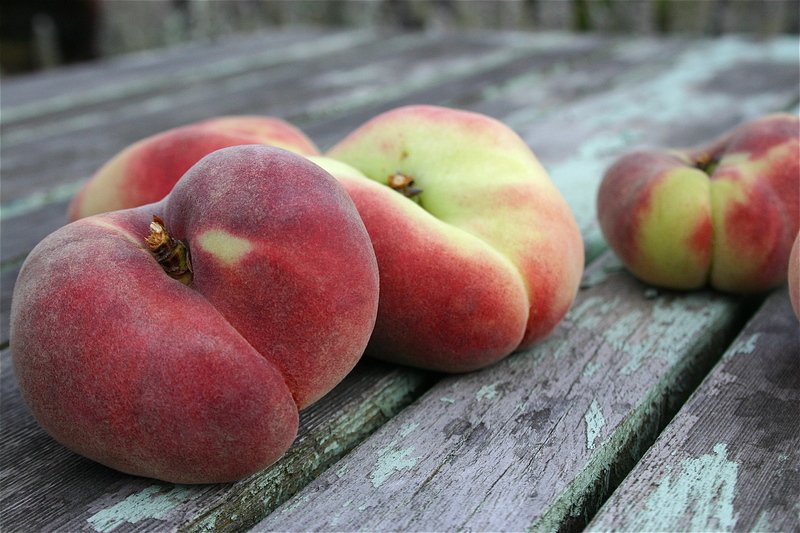 These saucer-shaped peaches are sweeter than your average Prunus persica, with delicate white flesh and lots of juice. And they’re pretty. So pretty that I bought a half dozen and balanced them on top of the cracker boxes in my basket, then shifted them around in the cart as I shopped to keep them away from the sharp edge of the salsa lid and the tipsy quart of milk. They made it into our fruit basket on the kitchen counter intact, where they stayed for almost three days before we finished them off. Which is a miracle, if you consider the odds: four people, six perfect peaches. My hat’s off to Brownfield Orchards in Chelan, who grew these beauties. Now I’m thinking…we have a spot in the backyard where a willow tree used to live and for two years we’ve been trying to decide what kind of fruit-bearing tree to put there. Maybe we’ll plant our very own peach tree (like one of these from Burnt Ridge Nursery) and bring a bit of Georgia into our back yard. In three to five years our daughter, who calls herself a “Georgia peach,” would be able to pick her own. Their almondy flavor and eat-it-over-your-plate succulence would make it worth the wait. 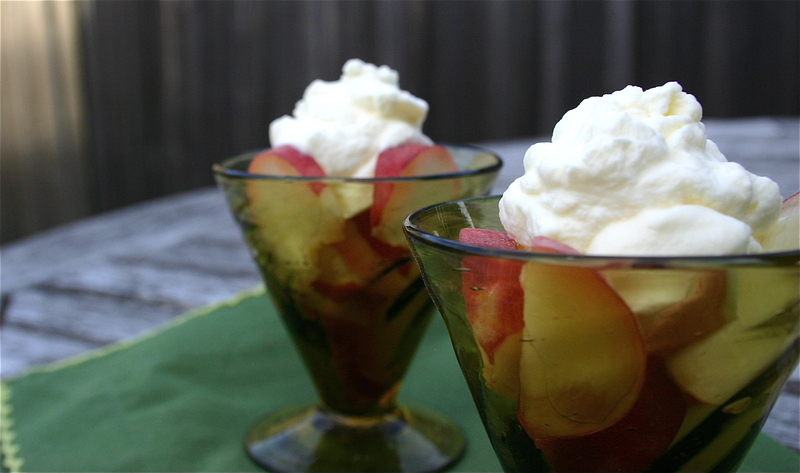 Until then, I’m taking cues from Chie’s recipes last week and serving local peaches with a bit of sweetened whipped cream, which may just be my new favorite summer dessert. We’ll see you back here with your peaches on Thursday. This entry was posted in Summer Fruits and tagged Cream, Local, Organic, Peach. Bookmark the permalink.